Is Auckland becoming the market capital of New Zealand? For years Aucklanders have spent weekends browsing and buying at the Takapuna, Otara and Avondale weekend markets. Recently two seven day a week food markets have been added to the mix. There is also the bi monthly Devonport Farmers market which began recently and I have yet to visit. 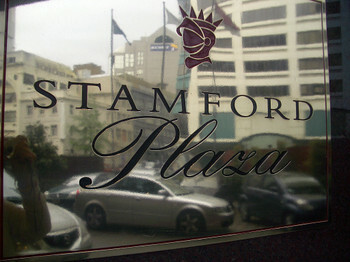 Last Sunday I made it to the first (up)market at the newly renovated Stamford Plaza in Auckland city. This was the first of what is to become a regular event on the last Sunday of each month. And very different it was too. Not a second hand book or vegetable in sight. We arrived and headed straight for the champagne table where for NZ$10 we purchased a flute of Comte Audion de Dampierre before doing a circuit of the room. The stalls were a mix of art, jewellery, fashion, furnishings, gourmet foods and some gorgeous pashminas made from the finest baby alpaca fibre . Next time we'll skip breakfast and try something from the small selection of food available. I don't remember seeing any tables and chairs to sit at but it would be nice to be able to linger over a coffee and people watch. Will we go again? Yes, I rather like the idea of a glass of champagne on a Sunday morning. 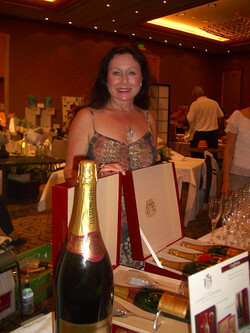 Or I could just order a case on line from Anne the Champagne Lady .